I was running late to the House of Holland show and in the midst of the craze was squeezed into my seat. The friendly lady next to me introduced herself… Henry Holland’s mother. She spent the last 3 days before the show sewing buttons on the samples. But only buttons… Henry only let her touch the buttons! My show buddies in London. Robin of Maria Luisa and Barbara of the British Fashion Council. Robin kept being stopped in the street to get his picture taken so I said why not, me too. Of course it’s raining in London! 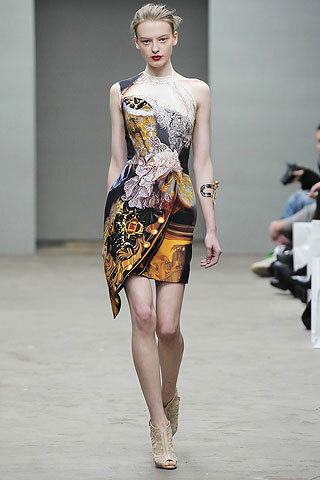 Mary Katrantzou… Finally we meet! This is the third season I’ve seen Mary’s collection in London. I always stop by the exhibition and just miss her. But I’ve met her mother each time. Last season, she was so happy to see me there, she called Mary on her cell phone and so I was able to chat with her over the phone. This time I finally got to meet her in person! The dress pictured is Mary’s favorite piece. This entry was written by barneysnewyork, posted on 02.23.10 at 9:03 pm, filed under Uncategorized and tagged British Fashion Council, House of Holland, London, Maria Luisa, Mary Katrantzou. Bookmark the permalink. Follow any comments here with the RSS feed for this post. Post a comment or leave a trackback: Trackback URL.